One of the great classic debates. Are you a Hydrox or Oreo loyalist? I haven’t eaten either of these in eons and by eons I mean the early 80’s. My dad was annoyingly quasi-kosher and didn’t allow us to eat Nabisco products so we were limited to Sunshine and Drakes- which isn’t a bad thing, but we only had Hydrox in the house – not that we even had them that much, and Oreos were a treat to be indulged in the safety of friends’ houses. So earlier this month, when I got the idea for this blog, I thought of this pair of creme-filled cookie facing off, only to learn Hydrox had been discontinued(!). The timing just happened to be right though. Kraft (who now owns Sunshine) was planning on bringing back Hydrox this month for a limited time for their 100th anniversary. Yes, I never knew Hydrox came before Oreos. I always assumed that because we were only allowed Hydrox growing up that they (like everything else we had) must have been the rip-off. You learn something new everyday! For this tasting I had Ethan and I tried them at home and I then brought the rest in to work to get the opinion of my co-workers in a group tasting. The work crew found Hydrox to twist off nicely, leaving one cookie side with complete creme intact, which some found as a plus. The cookie has a nice crunch and good chocolate flavor. One taster commented she didn’t like the creme but the majority thought it was ok. Also noted that when dunked in milk, Hydrox crumbled but this was mentioned as good thing. The group agreed that Oero was “smoother” when biting into. The cookie was a bit softer and didn’t crumble as much in milk. Also we found we could not get it to twist off with the creme on one side as easily as it’s Hydrox counterpart. The group also agreed there was a nice creme-to-cookie ratio. Some found the Oreo cookie to be too strong in chocolate flavor and a bit overwhelming. These are both very similar, but each had qualities that the group felt made them their own. In general they felt Hydrox had a lesser quality creme but a higher quality cookie. Oreo had clearer brand loyalty and one person had to be convinced to try a Hydrox but was pleasantly surprised it wasn’t terrible. Also, I’d like to add that with the resurrection of Hydrox, they have tweaked the recipe to leave out trans-fats. So in Hydrox’s defense to people not liking the creme as much, at least they are being a little more health-conscious. Although that’s not really a prioity when eating any of this stuff anyway. Are you a Hydrox or an Oreo person? Sweet, I love the Droxie!! I was bummed to hear that Hydrox will no longer be stocked in my local grocers. 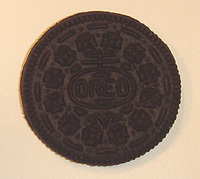 I refuse to eat Oreo’s based on principle!! My wife was so excited to see the limited return of Hydrox she bought 4 bags and plans to get more if we can find them. In the 70s and 80s at least, Oreos cream filling contained animal fat/lard, so they felt (and still do to me) greasier than Hydrox. HYDROX was always by far a better product, always was…especially the cookie part. Too bad they’ll probably discontinue them again. Oreo is by far a higher quality product. The creme in Hydrox tastes horrible, which ruins the entire cookie. oreo!! love the vanilla or peanut butter filled oreos! 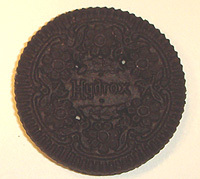 Hydrox was always seen as a cheaper knock-off of oreo, but when comparing prices, oreos costed less. I’ve never had a Hydrox but when I started eating Newman’s Own chocolate sandwich cookies I noticed that Oreo’s actually have a very chemical-ly taste. I can’t eat an Oreo anymore, not that that’s a bad thing. I recall enjoying both cookies, however it seems that Oreo has a darker flavor which I like better- a bittersweet edge that really sets off that cream, so I have to vote Oreo. I respect the Hydrox though, as an old fashioned, ground-breaking brand, and it can’t have been easy with a name that sounds like toilet bowl cleaner instead of cookies. FYI, Tasha, Hydrox came out first, so Oreo is the knock-off.